If you've never been at Hvaler before, and have just one day to explore the islands, we recommend that you visit Vesterøy - Hvaler in a nutshell! Almost all the natural conditions you can find on the other islands, are present on Vesterøy. If you arrive along the mainland road, Vesterøy is the first of the Hvaler islands you'll set your foot on. Vesterøy is a wonderful area if you want to go kayaking or hiking. Vesterøy is also the most rugged of the Hvaler islands, and most likely the one with the greatest variety in nature. The contrasts are so significant on Vesterøy that one can easily get confused and wonder if one is on the same island. If you move around the island in one day you will easily spot the differences in both nature and infastructure, and the highlights are plentiful. Some places on the island have densely populated residential areas, whereas other places look like there are miles and miles to the nearest household and people. Vesterøy has three nature preserves. In addition, the Outer Hvaler National Park stretches like a belt along the archipelago from the north-west to the south-west of the island. The vast network of trails, combined with public and private roads, provide excellent opportunities for discovery walks and partly on bike, as well. There are narrow paths and tracks in most places, but few marked paths. It is often easy to follow the landscape edge over the rocks, but often necessary to take a little detour around deep cracks in the terrain or because of dense vegetation. It often takes longer to hike around Vesterøy than it looks like when studying the map. It is good advice to take this into account before the trip. It is best to use your legs when exploring the large areas in the south-west. The view is magnificent from the wide open mountain areas, but it is possible to find a way down to sheltered coves in most places. The interior of Vesterøy leaves a totally different impression than the windy coastal areas. The terrain alternates between mountain ridges like Skjellsbuveten and Bankerødfjellet (Bankerødkollen, which is part of Bankerødfjellet, is Hvaler's highest peak at a dizzying 72! meters above sea level), and long, narrow valleys. In the middle of the island is Ilemyr nature preserve, which provides a unique experience. All vegetation is protected, but foot traffic is free. Kuvauen with the protected sea sheds is the only one of the old pilot harbors which has preserved its original character. Here are also great hiking areas. Guttormsvauen is an archipelago paradise with fantastic rocks and sandy beaches. Parts of Guttormsvauen is also a nature reserve and has a rich alder swamp forest. You will find the old Hvaler on Papper. Here are small fishing ports and a few small residential areas with old houses and narrow streets. 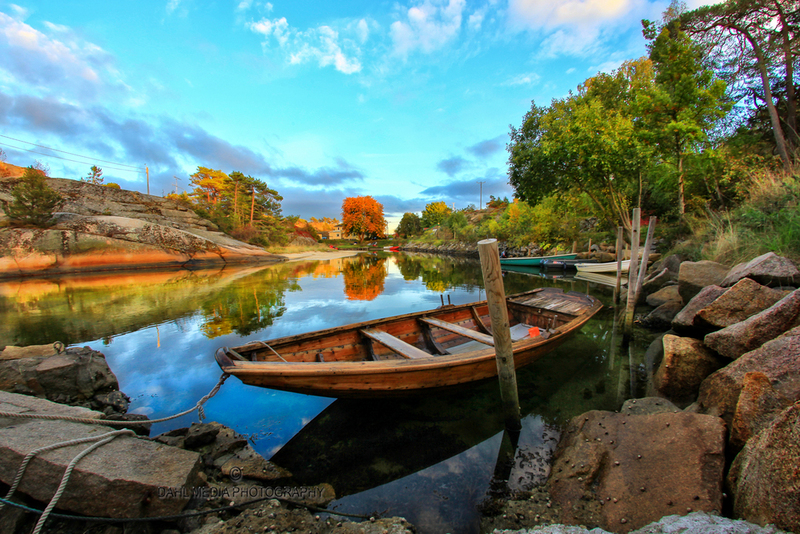 The areas near Papper are among the most popular ones along the Østfold coast to visit by boat. Both the local marina, store and pub are open in summer. Well protected behind Vauerholmen is Papperhavn. This is also another nice and very popular fishing harbor with boaters. The charming seaside place Papperhavn on the northwest side of Vesterøy has an own canal that the smallest boats can use as a shortcut to Vauerkilen. Many people associate Hvaler with summer, boating, salt spray, and rocks heated by the sun. Lesser known is the lush oases and swamp forests’ shade. The Ilemeyr nature reserve is just a place you might not expect to find here by the sea. In the middle of Vesterøy northeast by Utgårdskilen is the unique nature reserve Ilemyr. Here there is a wonderful, rare forest feel and marshland. All vegetation is preserved, but you may wander freely. The nature reserve Lerdalen with its touch of virgin forest provides wonderful and enchanting moods in its humid and lush environment. The forest type here is dominated by fern spruce. A few spruces in the center of the reserve are so enormously tall that they alone are worth the visit. In addition to the cozy environment in the fishing port Utgårdskilen, it is well worth the effort to visit the natural areas on both sides of the bay where you will find sandy beaches surrounded by rocks and forest, like in so many other places on Vesterøy. No one beats the quality and selection of the fresh seafood that Fjordfisk can offer. Fjordfisk AS is South-East Norway`s largest fishmonger of fish and shellfish. Fresh raw seafood directly to customers is their unique "trademark". Every day around 30 fishing boats deliver fresh fish to the facility in Utgårdskilen and Skjærhallen on Hvaler, as well as fish processing in Son (further north in the Oslo fjord). The long Skjellbo strait, which separates Spjærøy from Vesterøy, is an exciting hiking area with a good view of boating in the strait.